Videozoom were commissioned to create a video marketing campaign for Capita Customer Solutions, an established leader in the business process outsourcing market with multiple clients in both the public and private sectors. 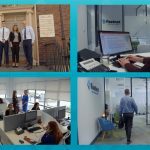 The challenge was to create a video marketing campaign that focused on the skills and experience of the company’s senior management team while showcasing the organisation’s dedicated staff and substantial technical infrastructure. We began the process by meeting with the client and learning about their key business activities. We then visited the company premises at Clonakilty, Little Island and Bandon and developed a production plan and shooting schedule. The production itself began with shooting in-depth video interviews with the senior management team in a specially created studio space at the Little Island facility.